According to this publication, “Societá Italiana Brevetti treats every piece of intellectual property as a business asset and carefully designs its brand strategy services around the commercial contours of clients in a way that is very effective”. According to this publication, “In terms of breadth of expertise, depth of experience and level of engagement in extracurricular and thought-leadership activities, Società Italiana Brevetti comes up trumps. Sophisticated brand owners which could have their pick of representatives flock to its doors”. Interviewed clients particularly appreciated our trademark and domain name dispute resolution services as well as our management of global trademark portfolios. 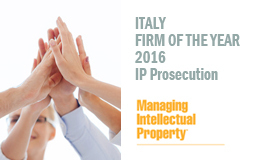 “Societa Italiana Brevetti’s trademark filing practice is simply excellent”. According to the guide SIB offers high quality, competitively priced services and “has a number of enticing unique selling points”, including a “great insight into the inner workings of the European Patent Office” and “proven superior expertise in the fields of pharmaceuticals and life sciences”.